Wall Guardian FW-100A is a liquid-applied fibered acrylic air barrier that also acts as a water/weather barrier and vapor retarder. Wall Guardian FW-100A exceeds ASTM E2357 (Standard Test Method for Determining Air Leakage of Air Barrier Assemblies) with an air leakage rate of 0.0004 cfm/ft2 @ 1.57 psf – 100 times better than the test requirement. The liquid-applied air barrier exceeded the standard in a single coat at 40 mils wet film thickness (40 square feet per gallon). The engineered system is designed to resist air and water infiltration, saving energy and preventing moisture build-up that can lead to mildew and mold. 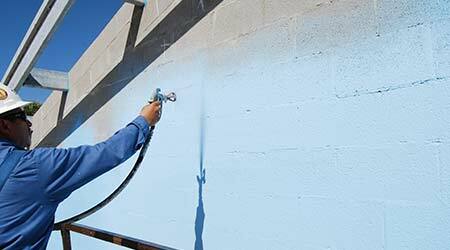 Wall Guardian FW-100A can be quickly applied to building material surfaces with a heavy-duty sprayer, roller or brush. The liquid-applied air barrier offers unified substrate protection, even on curved or other unconventionally shaped walls. The water-based coating is a very-low VOC product and meets LEED intent at 25 percent recycled content. The applied coating is also Class A fire rated.